Savers Cards Get Them Now! New locations for purchasing the Saver Card. The first 3 are from the Supporting Merchants list and the last three are Club Members. Saver Cards are available to members and non-members alike! So far the Saver Card is available at Arthur’s Auto in Rutland. This list just in from the Saver Card folks. Many thanks to the merchants for their generosity. Where to buy the Saver Card will be the next post. If someone reading this knows where the cards can be purchased please post in the comments of this entry so everyone will know! Thanks. Our New Saver Card is Here… Almost! 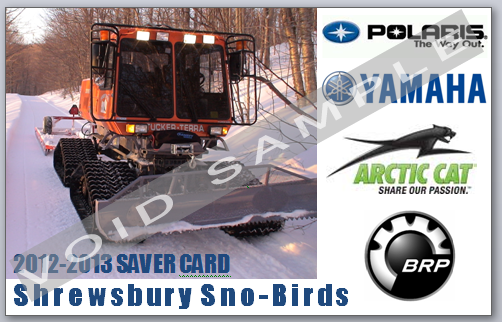 Some fine graphics are ready for the front of our 1012-2013 Savers Card. More details to follow like where to get them and the list of sponsors.